We are actively involved in exporting and supplying VPL IC Tester (UICTM). 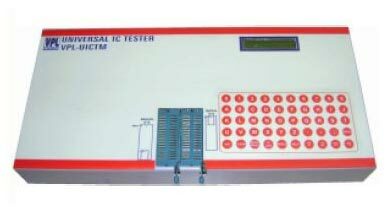 VPL IC Tester (UICTM) is a universal IC tester with membrane ASCII keypad. It is a table-top version, designed as a powerful tool for manufacturers, servicing engineers, R&D personnel to test a wide range of IC's of Digital, Analog, CPUs and RAMs. Built in self-diagnostic functions to ensure error free testing of IC. 2 nos. of potential free 40 pin ZIF sockets for testing analog and digital ICs. ZIF : Two 40 pin DIP ZIFs for analog and digital ICs. Key : Membrane type Alpha Numeric 50 Keys Keyboard. Digital : TTL, CMOS ICs including SSI, MSI, LSI, Functions including Gates, Buffers, Drivers, Flip-flops Counters, Shift registers, Latches, Multiplexers, Parity generators, Analog switches, CPUs, Microcontrollers, Peripherals, Static RAMs, Non volatile rams, Serial EPROMs etc. Linear : Transistor Arrays, Timers, Analog switches, Optocouplers, Display drivers, Line drivers, and Latch drivers, 7 segment display, LCD display, from 16 character by 1 row Upto 40 characters by 2 rows, Real time clocks, Analog to Digital converters upto 16 bit resolution and upto 40 pin Devices. Digital to Analog converters. Op-Amps (8 Pin 14 Pin, 16 pin). Comparators (8 pin, 14 pin, 16 pin) Op-Amp and Comparators (combined) Voltage followers (8 pin, 14 pin) Voltage regulators (Both +ve and ve), DPM ICs, DOT / BAR display drivers, PLLs, VCOs. Waveform Generator, Sample & Holds, PWM Generators.